Review of Rebecca Goldstein’s philosophy book Plato at the Googleplex. Rebecca Newberger Goldstein resurrects the Greek philosopher in an audacious, brainy book. By alternating between these new “Platonic dialogues” and a serious chronicle of Plato’s life and philosophy, Goldstein makes a plea for the continuing importance of philosophy as Plato (427–347 B.C.) conceived it, and for the enduring relevance of Plato’s contributions. And she retells what clearly was a formative event in Plato’s life: how Plato’s mentor Socrates, through speech alone, came to be seen as so dangerous to Athenian society that he was put to death. What are Plato’s contributions? Plato’s own views are elusive because he never wrote in his own voice, only through characters speaking in dialogue. But just as we do not look to Shakespeare or Goethe for a well-defined political worldview, Goldstein suggests that the value lies not in Plato’s particular proposals but in his questions and methodologies, the process in the dialogues by which ideas are considered, debated, and often rejected. The dominant character in almost all of Plato’s dialogues is Socrates. He is hardly portrayed consistently across the dialogues, but we have several sources on the real Socrates, 40 years Plato’s senior, whom Plato knew and clearly esteemed. Goldstein tells his story well, culminating in a moving and dramatic chapter, “Socrates Must Die.” Socrates, born in 469 B.C., was a self-declared “gadfly” in Athens while incessant wars between city-states were causing Greek society to self-destruct. Socrates acquired a vivid public reputation as a masterful debater who could poke holes in anyone’s beliefs, while maintaining that he himself was sure of nothing but his own ignorance. After the temporary downfall of Athenian democracy and a takeover by the so-called Thirty Tyrants, the restored democracy put Socrates on trial in 399 B.C. for what may or may not have been trumped-up charges: disrespecting the gods and corrupting the youth. The jury found him guilty and sentenced him to death, and Socrates drank the hemlock that killed him. Plato chronicles Socrates’ trial and death in a series of dialogues (the Apology, Crito, and Phaedo), but can they be trusted? I think it safe to say that Plato despised Athens for executing such a brilliant mind, and Plato’s Socrates is meant at least partly as hagiography. It’s easy to get behind Plato’s Socrates as he demolishes the confused, empty piety of Euthyphro, or as he makes a noble case for virtue being its own reward. It might have been less easy to get behind the real Socrates, who encouraged some seriously troubled characters such as Alcibiades (who was also one of Socrates’ lovers) and the tyrant Critias. Goldstein does not shirk from that question and spends quite a bit of time on bad boy Alcibiades, who seems to have combined the worst excesses of Bill Clinton, George W. Bush, and George S. Patton in helping to drive Athens to ruin. Yet Goldstein argues that Socrates was ultimately executed because he deferred to no one’s authority and tore down Athens’ idealized image of itself. In the claustrophobic public life of Athens, Socrates was tolerated (barely) when times were good, but condemned as a dangerous nuisance when things took a turn for the worse. When Leslie Gelb, reflecting on the rush to war in Iraq, spoke of the media and foreign policy experts’ “disposition and incentives to support wars to retain political and professional credibility,” he explained exactly why Socrates (who, like Plato, never took payment from students) was so irritating to the chattering classes of Athens: He ruined their credibility. His message, paraphrased by Goldstein as “Don’t be so hasty in donning yourselves with laurels,” fits America all too well today. Plato, then, took Socrates’ critical attitude and generalized it beyond morality and politics to the search for truth in all its forms. Plato may lack the scientific trappings of Aristotle, such as they were, but he possessed one keen insight that Aristotle ignored, and, one that eventually proved crucial to the scientific mentality: Our senses lie. It is not just enough to question our received cultural ideas and our intuitions; the most self-evident truths around us may prove to be nothing of the kind. The classic example is, of course, that the Earth goes around the sun and not the other way around, something we now take for granted but which still goes counter to every bit of visual evidence we possess. The rediscovery of Plato in the Renaissance heralded the scientific revolution; perhaps a coincidence, perhaps not. And since the more general revival of interest in Greek culture in the 19th century, Plato has been taken as many things. The great 19th-century English radical George Grote, who wrote an enormous tome on Plato, deemed him a liberal before his time, the champion of free thought. Philosopher of science Karl Popper declared Plato the founder of totalitarianism, while radical journalist I.F. Stone found that Socrates really had been an enemy of the people. The followers of political philosopher Leo Strauss believed that Plato revealed his real thought only to those in the know (i.e., Leo Strauss), creating a sadly influential “cult [for] neoconservative yuppies,” in the words of the great Plato scholar Gregory Vlastos. What to make of these conflicting views? Better to listen to Platonic scholar and philologist Holger Thesleff: “Too often, over the centuries, have Plato’s thought experiments been understood as his convictions or as revelations of profound truths.” Many of the dialogues are quite inconclusive, such as the dark Gorgias, which clearly served as Goldstein’s inspiration for Plato’s visit to Fox News. 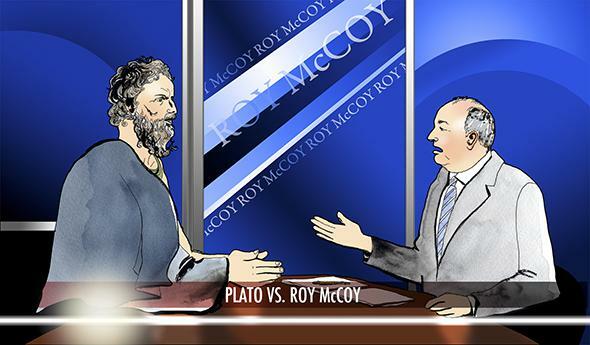 Just as “Roy McCoy” puts up invincible ignorance to everything Plato says, Callicles in the Gorgias refuses to be convinced by any of Socrates’ ethical arguments, preferring to advocate for the brutal “law of nature.” E.R. Dodds wrote that the Gorgias is Plato’s most modern dialogue: “The twin problems which it exposes—how to control the power of propaganda in a democracy, how to re-establish moral standards in a world whose traditional standards have disintegrated—these are also the central problems of the twentieth century.” And the answers are still not forthcoming, only the questions, and the process of searching. We can say some things for sure: Plato was very concerned with what truth was and how to reach it. He clearly believed that appearances were deceptive and that answers were not easy to come by. We need to educate ourselves—and Plato also obsessed over how we should educate ourselves—because we do not naturally possess the knowledge of what the world is really like, nor of how to conduct our lives in the best manner: in love, with friends and family, in politics, and when facing death. Outside of religion, which is not always the best place to find carefully reasoned answers, we rarely see these questions confronted directly today. Instead, books and articles take the form of “advice,” smuggling philosophical assumptions into their prescriptions for “self-help.” For Plato, this is backward, as self-improvement is what serves the search for truth, not the other way around. I agree. It’s baffling that these books should tell us how to better ourselves and be happy without putting forth a cogent theory of why what they propose is such an improvement. (I would rather read Why Chicken Soup for the Soul Is Chicken Soup for the Soul.) When people are debating whether Sheryl Sandberg’s Lean In is good or bad advice for women, they are really asking whether Sandberg’s conception of the good life is valid, not whether Sandberg is too privileged or insensitive. You can destroy Amy Chua’s book with statistics, but her provocation comes not in her thesis but with the underlying assumption that a certain sort of achievement is all that matters in life. Chua’s books wouldn’t cause such grief, and would surely just be ignored, if people felt already confident of their own accounts of success, self-esteem, and excellence. By merely being reactive to the unstated assumptions in such books, readers never get reach stable ground so that they can confidently say, “Amy, you’re missing the big picture,” which is precisely what Plato does when debating Goldstein’s version of her. “Would it not be better,” Goldstein has anti-authoritarian psychoanalyst Mitzi Munitz challenge Plato at the 92nd Street Y, “to try and rear all citizens so that they can assume full power over their own lives as fully functioning grown-ups, according them the dignity and autonomy of responsible human beings, instead of putting them under the guardianship of those who would think and act for them?” Plato’s answer: “Thinking is very hard.” The bar of reason is very high indeed. This fault line emerges poignantly in the section entitled “xxxPlato,” where Plato advises Slate’s own Prudence (in the form of previous Dear Prudence columnist Margo Howard). In advising a frustrated Ph.D. student to seek knowledge for its own sake and not for prestige, Plato comes off as impractical. The Ph.D. student is so consumed with making ends meet and having a job that she lacks the luxury to sacrifice her well-being for philosophical ideals. Plato was a rich aristocrat set for life, but most budding philosophers are not so lucky. Is philosophy either a bourgeois affectation (for those well-off) or a pathological ailment (for those who are not)? Even worse, if philosophical thought really is required to figure out how to lead a good and fulfilling life, what does it mean that most people are too burdened to have the time to consider it? Goldstein makes a compelling case that philosophy’s methods are useful to all, but that Plato’s high-mindedness will not satisfy those caught in the gears of making ends meet, or even raising a family. Yet you can read this as an imperative: If philosophy genuinely is required for people to reflect sufficiently on their lives and actions, society should put a priority on encouraging the development of critical thinking skills—not in the direct service of a vocation, but in service to people becoming better human beings. It is an ideal worth maintaining even for those of us far too busy to live the life of the mind. Reading Plato can be challenging—maddening, in fact, as arguments multiply and no genuine resolution ever seems to be at hand. This is, alas, the challenge of serious thinking. Goldstein covers a tremendous amount of territory in her fantasia on Plato, and I’m neglecting her keen insights into the scientific process, political discourse, and the work of love. Not all of her conceits work, but the sheer rigor and intelligence on display here elevate Plato at the Googleplex far above the slippery anecdotal approach of a Malcolm Gladwell book. Goldstein is comprehensive in her knowledge of Plato and draws on the most thoughtful traditions of Platonic scholarship in the last decades (scholars such as Gregory Vlastos, Myles Burnyeat, and Debra Nails), and she presents a comprehensive overview of a philosopher whose only serious rival for influence in the secular world is Confucius. She presents Plato at his best and most relevant—the Plato most deserving of our attention. Above all, my Plato is the philosopher who teaches us that we should never rest assured that our view, no matter how well argued and reasoned, amounts to the final word on any matter. And that includes our view of Plato. When he visits Google, Goldstein’s Plato questions an engineer’s suggestion that ethics could be crowdsourced. I was reminded not of any philosopher, but of hacker/activist Aaron Swartz. Many years before his persecution on trumped-up charges by the government and subsequent suicide, he wrote a scathing review of James Surowiecki’s The Wisdom of Crowds, which concludes: “Surowiecki’s book fails because of a lack of dissent. Nothing goes against the grain, he doesn’t justify his positions, and he has clearly prejudged the question.” There was a true heir to Socrates and Plato. Plato at the Googleplex: Why Philosophy Won’t Go Away by Rebecca Newberger Goldstein. Pantheon.